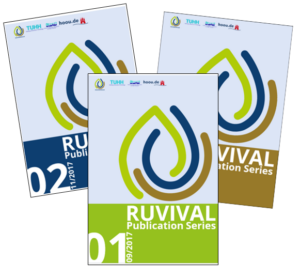 Every week, we present you with new RUVIVAL Toolbox Elements on various topics concerning sustainable rural development. We produce these elements in collaboration with Master and PhD students and researchers at the Institute of Wastewater Management and Water Protection (AWW) at Hamburg University of Technology (TUHH). The process includes many feedback-rounds to ensure high quality standards. The presented Toolbox elements contain therefore most relevant and up to date information. The goal is to communicate scientific results in a practical and understandable way. We asked one of our students, Maria Monina Orlina, to tell us how working with RUVIVAL was for her. 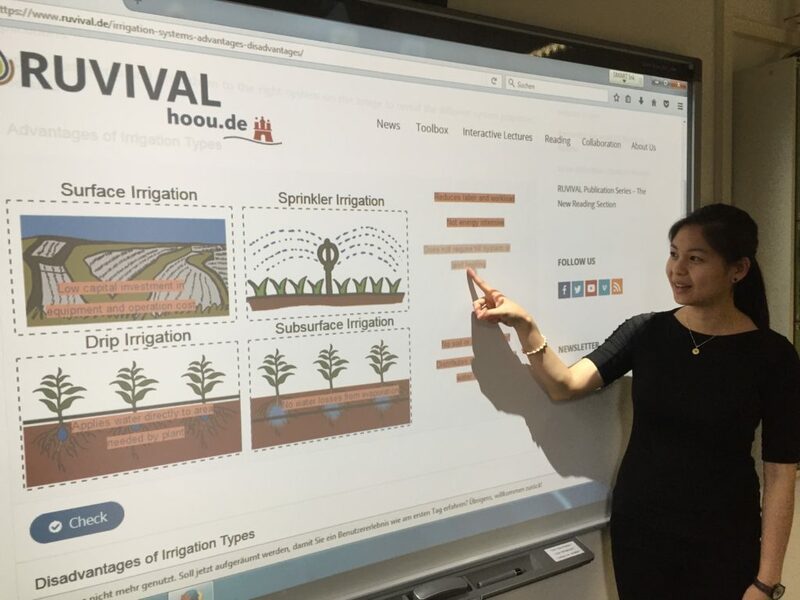 Maria Monina Orlina created the Toolbox Element: Sustainable Irrigation under supervision of Ruth Schaldach and Prof. Dr.-Ing. Otterpohl as a project work during her Joint European Master in Environmental Studies, Cities & Sustainability. Why did you decide to collaborate with RUVIVAL? In the summer semester of 2016, I took 2 classes under Professor Otterpohl. In particular, I enjoyed his class Water and Wastewater Systems in a Global Context. The students participated in a Simulation Game wherein we had to design an eco-town in either Wales or Ethiopia. I really liked the concept, because each group was assigned a sub-group (e.g. transportation, waste water, buildings) and we had to propose the best plan depending on various conditions of the given environment. Further, Professor Otterpohl had mentioned in one of his lectures regarding an upcoming project that required video editing and movie making work. I’ve had some experience in the past, creating short films for school and personal projects. From there, I knew this was something I’d like to be involved in. How was the experience of making RUVIVAL Toolbox Elements? The experience was both challenging and enjoyable. I was able to use my different set of skills, both technical and creative. Research and writing was involved to create a technical paper composed of a Literature Review. At the same time, drawing, editing with Photoshop, creating stop motion videos were major tasks required. This was the part I enjoyed more, because the creative aspects allowed me to use the “left side” of my brain! Moreover, there is good collaboration in making the OER because, with the work of fellow students, I could pick up some inspiration from them in order to come up with something unique for my own elements. My biggest take-away from this project, aside from expanding my knowledge regarding Sustainable Irrigation, was learning how to make a stop motion video! This was the first time I had done such type of movie. Why did you choose this particular topic to work with? Irrigation was a topic I had always been interested since college, as I had a few classes on it during my undergrad years. Also, prior to starting my project work with RUVIVAL, I had just finished an internship at the Center for Water-Energy Efficiency in UC Davis California, with my work focusing on groundwater use in agricultural irrigation. Since I had done quite extensive research on the topic, I wanted to expand my knowledge regarding sustainable irrigation even further. Fortunately, this was a topic that the team wanted to tackle within the project. What do you think of the RUVIVAL project? I think RUVIVAL is a great initiative to promote learning through an online platform. There are many ways to gain knowledge nowadays, most especially via the Internet. RUVIVAL takes it even a step further with its Simulation Game, wherein one can collaborate with others to create a practical output based on learnings made from the other tools (interactive lectures and videos). The approach and style is simple and it is accessible to everybody. Anyone can learn from it depending on whichever rural topic they would like to study. Have a look at the RUVIVAL Toolbox Elements Monina created here. Interested in creating RUVIVAL? Please get in touch with us using our contact form.